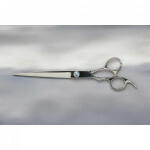 Thinning or Texturing scissors are used to thin and shape the coat,they can be used to take off sharp scissor lines and trim long hair in sensitive areas etc. 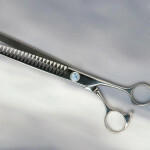 Razorline's range of pet grooming scissor styles. 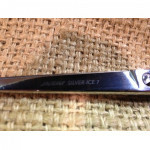 Razorline Left Handed Pet Grooming Scissors. 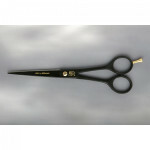 Left handed Scissors great for all round pet grooming. Curved pet grooming scissors. great for all round pet grooming. eks Pet grooimg scissors Solingen Germany. 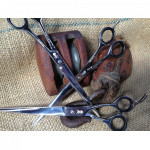 "SALE ON NOW"
eks Scissors German stainless steel. 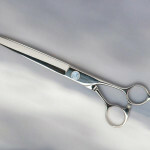 eks Curved Pet grooming scissors. 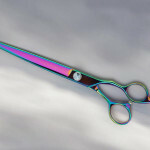 "SALE ON NOW"
German made high grade stainless steel curved pet grooming scissors. Blue Minx scissor range. "SALE ON NOW"
The Blue Minx range of scissors. Santorini Pet grooming scissors. 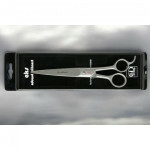 "SALE ON NOW"
Santorini range of Pet grooming scissors.